In 1997, Richard Lee Norris suffered a horrific gun accident that ripped off his nose, chin, lips and teeth and turned him into a recluse. 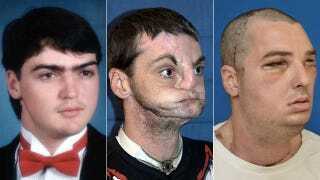 15 years later, doctors were able to perform the "most extensive face transplant ever" and give him a brand new face and new life. Face transplants are always so futuristic science cool but this "most extensive" transplant takes it to another level. According to the Baltimore Sun, the 37-year-old Norris received donor skin from his scalp to his neck, along with new teeth, tongue, muscle, tissue and a jaw. Doctors had to go even further than just matching Norris' blood type with the donor, since they had to consider skin tone and bone structure for face transplants. Doctors from the University of Maryland had been working towards completing a full face transplant like this, tweaking and improving ways to help prevent the recipient's body from rejecting all the new tissue, muscle, skin and bone transplants that go into surgery like this. The face transplant process starts with specific drug treatment, a strong immunosuppressant drug during surgery and a life-long drug cocktail following surgery (to keep them from rejecting their faces) and then follows with a donor whose family would approve to donate a face.